Khadijah listened as her aunt tearfully complained to them about her miserable situation. She was saying, “So you see, I have received nothing for my trouble. Both of my children disregard all that I have suffered for their sake. I sold my last gold ornament to send my daughter abroad. I have mortgaged my house twice to enable my son to become a doctor. She wept bitterly, unable to continue. Khadijah gave her something to drink and Khadijah’s mother tried to comfort her sister. 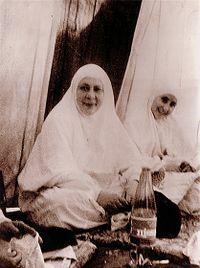 Khadijah told her aunt gently, “…It is a pity that you have taken so much trouble to raise your children. You have brought them up in such away that you yourself produced the present state of affairs. “Oh, I am a broken-hearted woman. What can I do for you?” her aunt replied. Then she accepted their kind offer gratefully. Khadijah mentioned a narration of the Prophet of Islam (SAWS) in this regard, which states: A Muslim believer came to the Prophet (SAWS) and asked what he could do to please Allah. The Prophet (SAWS) asked him if he had a mother, and the man said: “No”. Then the Prophet (SAWS) asked if he had an aunt, and he answered: “Yes”. The Prophet (SAWS) recommended that he should look after her and love her because she had the same position as mother. The aunt feared that she would be a burden to them. The aunt moved to her new home and was comfortable and at ease for the first time in her life. She never felt like an intruder, and Khadijah accompanied her when she attended religious meetings. The aunt benefited very much from these meetings and enhanced her religious knowledge. She compared Khadijah’s happy marriage to her daughter’s. She could feel the harmony and spiritual understanding between Khadijah and her husband, and recalled her daughter’s life, which was full of quarrels resulting from jealousy, selfishness and indifference. She could easily differentiate between the normal, healthy life of her niece and the disturbed, unnatural one of her daughter. She could do nothing but pray to Allah to guide her daughter and son to the right path. Early one morning a few months later, the doorbell rang continuously, and Khadijah hurried to open it. She was surprised to see her cousin standing at the door, carrying her child in her arms. Her eye was black and she looked pale. Khadijah welcomed her cousin and took her to her mother’s room. The mother was surprised to see her daughter, and she rushed towards her to take her in her arms. She thought that her daughter longed to see her and she had regretted her past behavior. But her daughter sat down on the nearest chair without the faintest idea of her mother’s feelings. Her daughter replied, “Oh, mother. You know how he is. He returns home late every evening, quite drunk. He throws himself on the bed dead with sleep. When I object to his behavior, he reminds me of our deal that we should respect each other’s freedom. I can do nothing but keep silent, since this idea of freedom was my wish from the beginning. But things have grown worse recently. He has started to help himself by my salary and deprived me of my rights in my house. “Will Allah accept my repentance after years of deviation?” her cousin asked. The cousin spent a few weeks with her mother. She was greatly affected by Khadijah’s strong faith. Khadijah did her best to help her, and she gave her some Islamic books that she read and discussed later. Khadijah’s cousin eventually became a good Muslim, and she knew she could no longer live with a man addicted to drinking and gambling. She filed for divorce. She gave up all her rights to her home in return for keeping her only child. She intended to raise him to be a good believer.